Falconry is a unique and ancient hunting partnership between human and bird but falconry is not easy; it requires dedication, money and time. Falconry is the hunting of wild quarry with a trained raptor and in order to hunt with a bird of prey, you must have a hunting license. To get a hunting license, you must take a hunter safety course, also known as the gun hunter safety course. Your local MNRF office will provide you with information on courses that are offered in your area. Hunting is the difference between being a falconer and being a “pet-keeper”. Raptors do not make good pets and falconry regulations where put into place to allow for hunting with a bird of prey, not pet-keeping. If you are fascinated with birds but not interested in hunting with one, we respectfully suggest that you work with bird species other than raptors. Once you have acquired a hunting licence and participated in the Orientation workshop, join the OHC. We encourage new members to come out to Club events and spend some time hunting with falconers before they go any further. 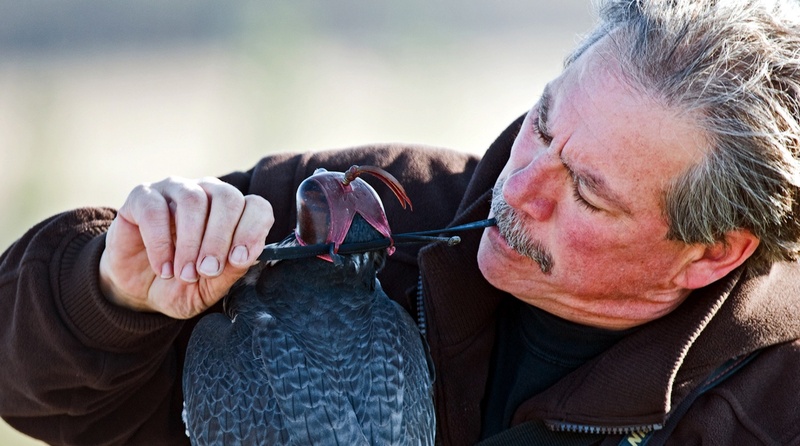 This is the best opportunity to decide if this sport is really what you thought it was going to be– before you spend a lot of time and money and before you get a bird of prey. Download Falconry Apprenticeship Guidelines here – a reference guide to answer basic questions. Falconry apprentices must be sponsored by a falconer who has been licenced for at least five years. Once you’re an OHC member and have a hunting licence, the Ontario Hawking Club will assist you in trying to find a qualified sponsor. Sponsors are experienced falconers who donate their time and expertise to help develop falconry excellence in beginners throughout the 15 month apprenticeship period. In general, sponsors are looking for apprentices that have done their homework, are highly motivated and are committed to hunting with their birds. However, membership in the OHC does not guarantee a sponsor. 5. Build your facilities and purchase equipment. With housing and equipment, the bird’s safety is the primary concern. The OHC has established facilities standards that outline housing parameters for various raptor species. Download detailed facilities requirements guidelines here. Your hawk house must be large enough so that the hawk will have freedom of movement-generally an 8′ x 8′ x 8′ pen is sufficient for a free-lofted red-tailed hawk. Captive hawks and falcons must be protected at all times from cats, dogs, and other predators, including humans, as well as extremes of heat and cold, wind, and dampness. They should be provided with a weathering place where they may be kept outdoors in good weather and have an opportunity to bathe. While most raptors adjust well to cold weather, some do not. They also suffer in heat and must never be left in the direct rays of the summer sun. You can expect to spend $1,500-$2,000 to construct an adequate pen. You will also need basic equipment that includes: grommets, anklets and jesses, a leash, swivel, outdoor perches, an accurate scale and bath pan. Once you have a hunting licence, a sponsor and have built adequate housing, you will be ready to acquire a bird of prey. Apply to the MNRF for an Apprentice Falconry licence. A Falconry Apprenticeship is a 15 month term, which includes two autumn hunting seasons with a falconer who has held a General Falconry licence for at least five years. Upon successful completion of your apprenticeship, your sponsor will sign your paperwork and you graduate from an Apprentice to a General falconer. Trapping: After you receive your falconry apprenticeship license, you may apply to trap an immature (passage) red-tailed hawk. There are tremendous advantages to starting with a passage red-tailed hawk–they have hunting experience and they are adapted to our climate and quarry. Finally, if you decide that falconry is not for you or you are unable to continue with it for some reason, the bird can be released back to the wild. If you are unable to trap a bird, a female Harris hawk makes a suitable alternative. They can be purchased from Ontario breeders. Time: A falconer must have sufficient time and patience to devote to training and flying a bird. Training a young falcon requires a commitment of several hours every day and if this time is not available — if school, work, business trips, or family interfere — it is far better never to begin. Money: There is significant investment required to begin in falconry and you can expect to spend $1,500-$2,000 to get started. On average, it will cost $500.00/year to buy quality food for one bird.